Some books entertain the readers; some others enlighten them. Some educate and some others elevate them. This book on the subject of numerology based on the research done with Chaldean system of numbers entitled “SCIENCE OF FORTUNE” does everything and is an invaluable guide! It is the brainchild of the author who may be truly called Father of Numerology in this part of the world. It’s Tamil edition “ADHISTA VINGYANAM”, when first published in 1954 by famous numerology specialist Pandit Sethuraman created a lot of sensation all over the world. It’s the best selling numerology book and latest numerology book ever written by Pandit Sethuraman. It was best selling numerology book in 19th century reprinted twenty six times until 2013 without any publicity or promotion. That time period “Adhista vingyanam” is the best book on numerology written by Indian author. The same work has been translated into English as “Science Of Fortune” by Pandit’s son and disciple Sri.V.S.Guruswamy who himself is a numerologist of world renown. He also added some interesting chapters and illustrations. The English version was brought out in the year 2003 has a complete book of numerology and it has sold fifteen editions until 2017 without any publicity and only by word of mouth of the readers. Based on several years of intensive study and research into the mysterious but astounding role the numbers play in human lives, the author discovered a definite pattern of events which correspond to their dates of birth and names. 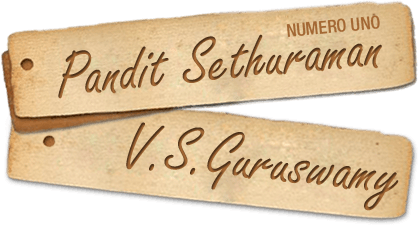 First time in the history of predictive sciences in the world, only Pandit Sethuraman gave readings beyond the number 52 and up to 108 having based the interpretations on the wide array of ancient scriptural and spiritual works in his possession. He explains in the book how people should have spellings of their names and arrangement of letters as per their dates of birth. He also gives exhaustive suggestions regarding the secrets of perfect timing of activities to improve one’s fortune. He asserts that keeping names in harmony with the dates of birth has proved that it could bestow happiness and fortune even on hitherto unfortunate people and that it can cure certain complicated diseases that were believed to be incurable by the medical profession. The wide clientele of the author comprising of kings, presidents, ministers, scientists, industrialists and also people from other walks of life, prove that the magic of numbers could play an important role in everybody’s life to attain success. One cannot deny the scientific truth that we, on this earth, hardly escape the influences of the planets around us. In Numerological parlance, the influences, which are actually the cosmological electromagnetic waves emanating from the planets, are represented by numbers which are universally accepted. So are the English alphabets employed in this book which are assigned numbers as per the Chaldean system of numerology. The author’s contention on the basis of his research into ancient Indian Scriptures is revealing and convincing as to why we use English alphabets. Your date of birth may not be comprising lucky numbers and certainly you cannot change it. But if your name number is lucky, you can overcome the hurdles in all your endeavors and emerge successful and fortunate in life! This is the very gist of his findings and the best among the works available anywhere in the world. Yes! In this e-book, you will find everything from A to Z to become fortunate and happy, thanks to the untiring efforts of Mr. V.S. Guruswamy, the son and disciple of Pandit Sethuraman! This eBook was brought out mainly to propagate this predictive science even in the remotest parts of the world to help everyone achieve success and live in harmony. To anyone who is in need of an authentic and reliable ready-reckoner on the subject of Numerology, “Science of Fortune” is the only choice and best guide.